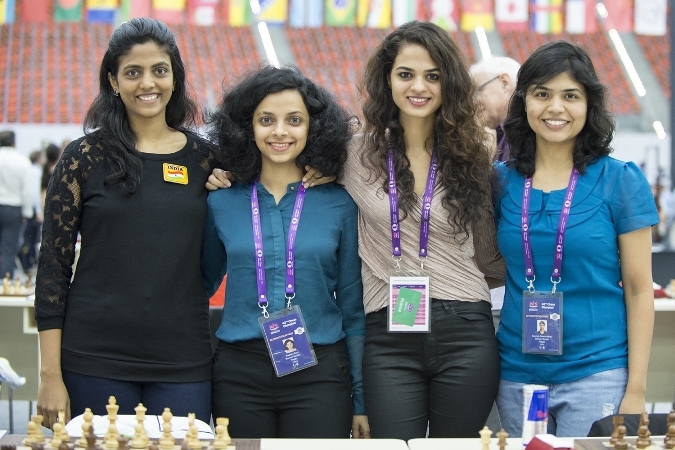 The USA overwhelmed India 3.5:0.5 on Friday to set up the most anticipated match of the 2016 Baku Olympiad – a potential gold medal decider between the USA and Russia. Russia are currently a point back with five more teams, including England, who scored a stunning 3:1 victory over defending champions China. 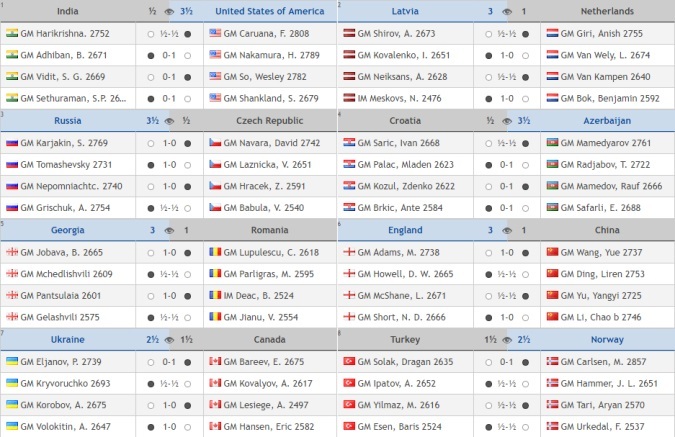 Remarkably the same USA-Russia match will be played in the women’s section, where Azerbaijan, the Netherlands and China are also in the five-team group that leads with four rounds to go. There’s nowhere else to start but with the USA flexing its considerable muscles to finally stop the Indian juggernaut. It was always going to be tough for India, since it’s not just that the USA have three top 10 players on their team, but those players are all performing above their rating! In Round 8 they showcased their particular talents. 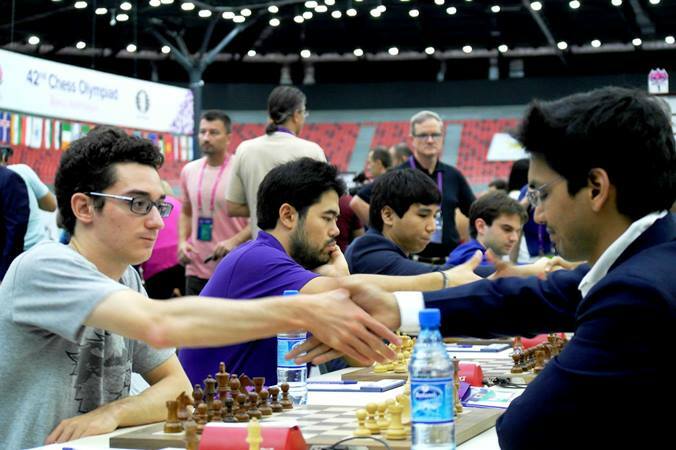 Fabiano Caruana was fearless as he took on Harikrishna in the sharpest possible game, sacrificing a piece for activity against the white king. 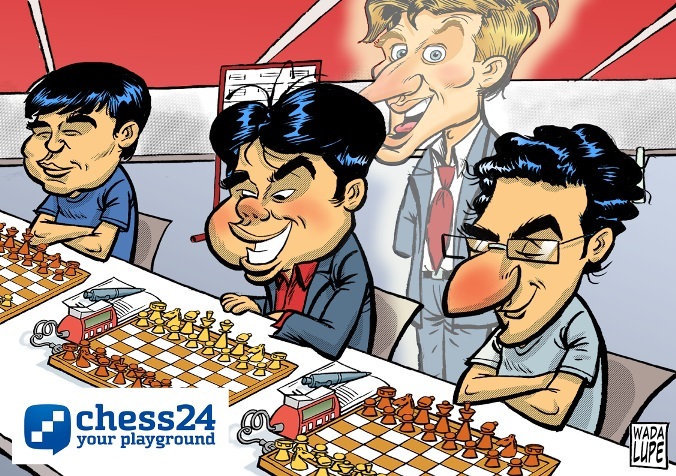 It may objectively not have been enough, but when the Indian star did the seemingly logical thing – exchanging queens – it played into Caruana’s hands, with Harikrishna forced to head for a draw before he got into trouble. On boards 2 and 3 the American team was unstoppable. Hikaru Nakamura seemed to have seen everything in a complex tactical sequence involving multiple pinned pieces. When the dust settled he had an easy win over Adhiban. Wesley So, meanwhile, pulled off his usual trick of converting a slight edge into a win with flawless technique. Vidit never stood a chance. 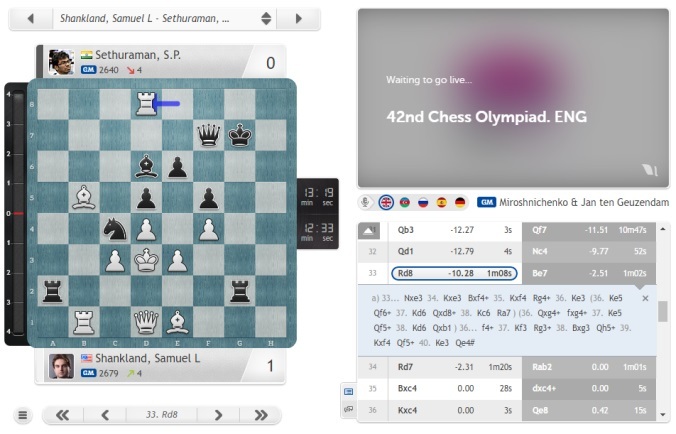 Luckily for Sethuraman that meant his adventures against Sam Shankland were irrelevant to the match outcome – though it didn’t seem that way at the time. From the moment the US player allowed his opponent to get rooks on the second rank it looks as though White was busted, with the evaluation climbing as high (or low, if you prefer) as -13.04. So what went wrong? Well, in fairness to Sethuraman, the killer blows were anything but trivial – especially to find in time trouble in such a crucial match. Black needed to calculate, or believe on intuition alone, that he could sacrifice both minor pieces starting with 33…Nxe3!! Instead after 34.Be7? 34.Rd7! Rab2? all White’s edge had gone. In a few more moves the white king had escaped the trap, the white pieces were suddenly targeting the black king and, crucially, White was simply two pawns up. Sethuraman put up defiant resistance, but had to concede defeat on move 75. That win saw the US team leapfrog India into the sole lead with 6 wins and 1 draw, meaning those who wanted to remain in the chasing pack needed to win. 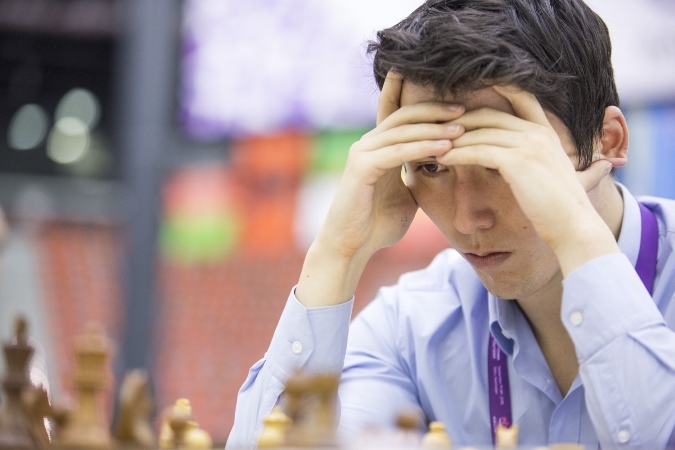 Russia did that in style, with Sergey Karjakin dispelling any team nerves when he cut through Czech no. 1 David Navara’s defences in just 24 moves (four of which weren’t strictly necessary!). Evgeny Tomshevsky rehabilitated himself after the Ukrainian debacle with a convincing win over Laznicka, while Nepomniachtchi did his thing – manoeuvred around in a roughly equal position until his opponent crumbled towards the time control. 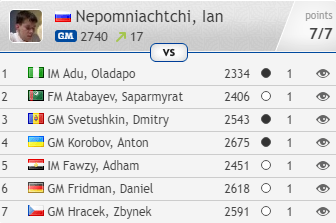 That’s 7 out of 7 for Nepomniachtchi now in Baku – for once someone actually completed “a Caruana”! 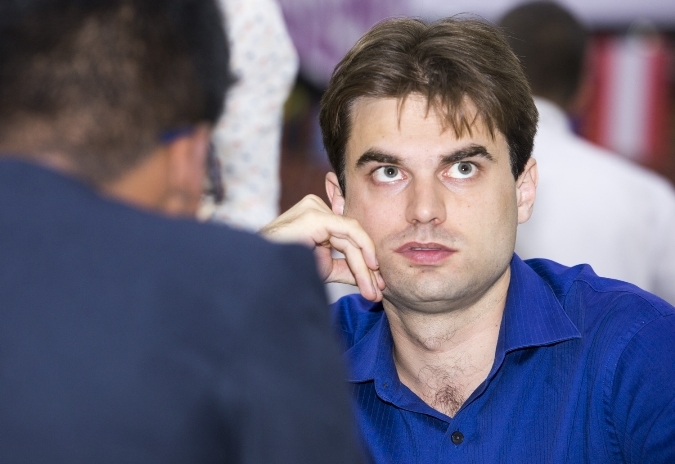 (yes, the opposition hasn’t quite been of Sinquefield Cup level - but maybe he isn’t finished yet…). Ukraine bounced back after their loss to the USA, but it wasn’t exactly convincing. 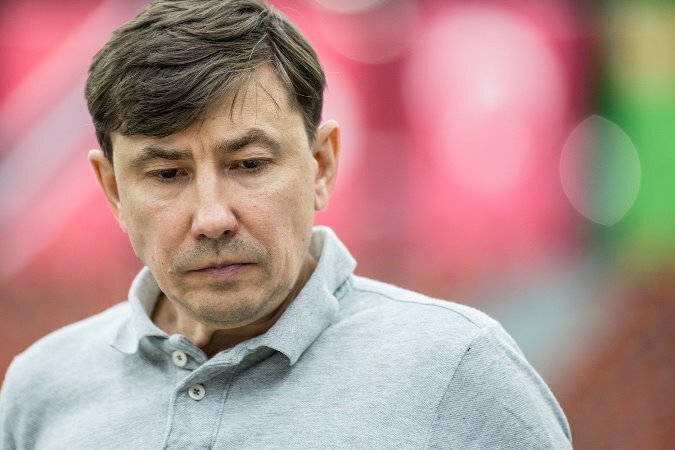 Pavel Eljanov sacrificed a piece for no less than four pawns, one of them on the seventh rank, but that wasn’t enough to stop the wily Evgeny Bareev winning the endgame. Although Bareev now plays for Canada, he may have thought of that as some kind of “revenge” for the Russian team’s earlier loss to Ukraine. Here 36.h6! would have given White excellent winning chances, but Eric couldn’t resist the flashy 36.Rxd5?, when if 36…Qxd5?? there’s 37.Qd8+ Kg7 38.h6+! Kxh6 39.Qf8# Few players are tactically sharper than Volokitin, though, and he blitzed out the refutation 36…h6! in four seconds flat. Hansen went on to exchange queens and get outplayed in the ending – in hindsight he’d have bitten the bullet, played 37.Qf6 and forced a draw by perpetual check in the near future. Li Chao’s knight sacrifice contains a cunning trap, but he didn’t realise it! Play continued in Pac-Man fashion with 33…fxe5 34.Bxe7 exf4 35.Bxf8 and now 35…Bxd4! may have come as a cold shower to the Chinese player. Instead it turns out 34.f6!! is game over (e.g. 34…gxf6 35.Bxe4!, with the threats of Rg8+ and Bxf6+). If you don’t believe that make sure to check it out with a computer here. 36.f6!! would still have been enough for a draw, but after that it was Nigel having all the fun. It was a narrow path to victory, and he didn't always keep to it, but he got there in the end. In summary, it was an insane, utterly human game, and just the kind you don’t want to see spoiled by anti-cheating regulations. 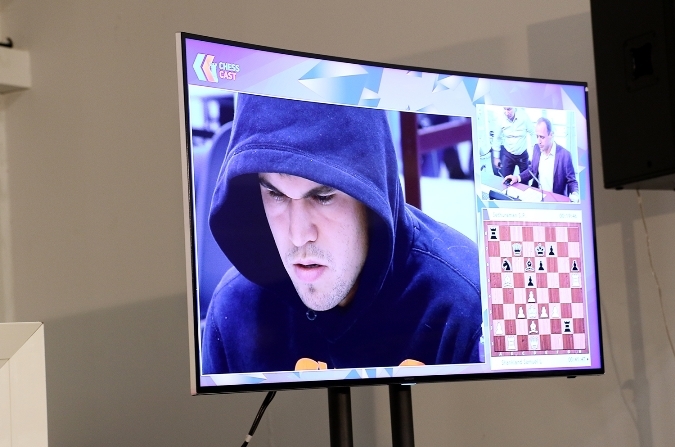 The Chess Olympiad hasn't avoided cheating scandals in the past, and this year numerous measures are being taken to combat cheating, including checking random players during each round. The emphasis was ours, with the idea of interrupting players during (not before or after) a game to check them obviously controversial. As some commented at the time it was announced, could anyone imagine Vassily Ivanchuk submitting to such a check? So England could safely savour the success! We need to mention two dark horses at this point. 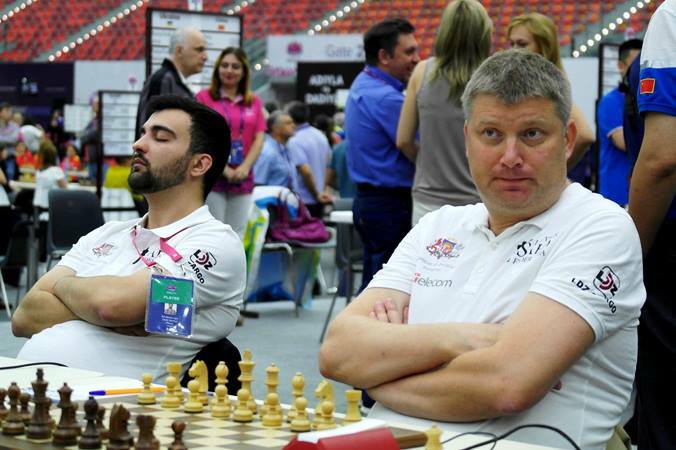 Latvia lost one match to Belarus but have won the rest, twice managing to triumph despite a loss for Alexei Shirov on top board. Their driving force has been Igor Kovalenko, who cryptically tweeted after beating Hungary in Round 5 that they’d won “because we had three games with White”. When asked for an explanation he replied that it simply didn’t matter to him which colour he played. 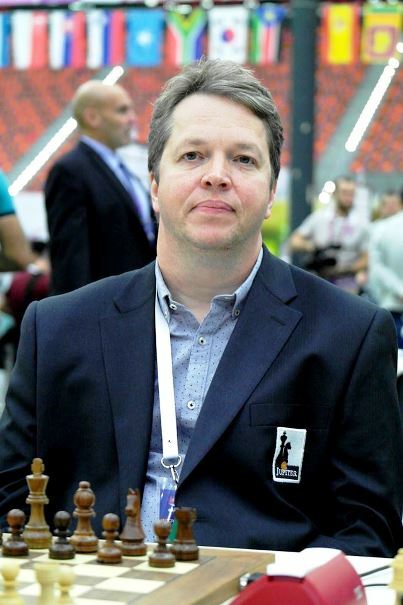 Indeed, Igor has now won three games with the black pieces, with his latest triumph against Loek van Wely, after a white attack ran out of steam. The 3:1 loss was a heavy blow for early leaders the Netherlands, with Anish Giri on top board only managing to replay a spectacular draw with Black that was probably more fun the first time it was tried by Ganguly and MVL. You can consider it a mark of quality that after the end of the game I was asked to undergo an anti-cheating check It seems to me that such things are never redundant, and the stricter and more closely they check and monitor the fairness of the struggle the better! 41.Rxg7+! Kf8 (41…Kxg7 42.Qh6+ Kg8 43.Nf6#) 42.Rg8+! Kxg8 43.Nf6+ Kg7 44.Nxe4 Rxe4 and just to ensure resignation was instant: 45.Qd3! Ponomariov is up next for Jobava. Monika herself came close to clinching victory for Poland, but couldn’t convert an extra pawn into a win. 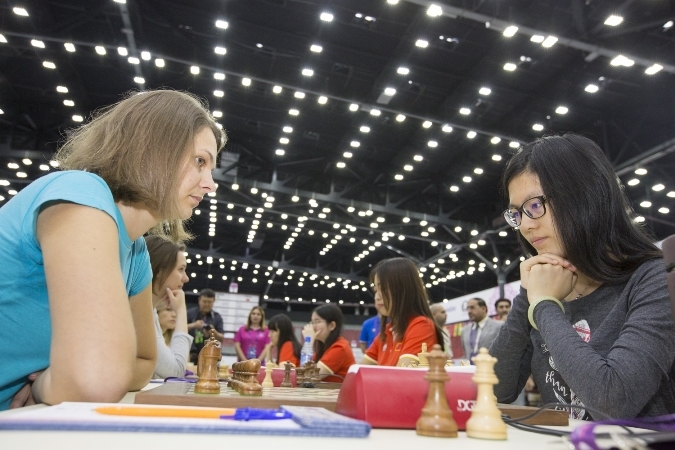 On bottom board Klaudia Kulon finally conceded a draw to Natalia Pogonina, after six wins in a row. That gave a chance to the teams below Russia, and they took it. Top seeds China needed a single win for Tan Zhongyi over Natalia Zhukova to complete a very bad two days for Ukraine. It was worse for one of the big women’s teams, Georgia, who fell to the Netherlands and now have two losses and one draw to leave them down in 20th place. Tea Lanchava was the Dutch hero, with her fifth win in six games enabling her team to join the leaders. Azerbaijan gave local fans something to cheer by beating India, with Gulnar Mammadova beating Tania Sachdev and taking her rating gain in Baku to 44 points! Needless to say, don’t miss Round 8 - Open | Women - and if you're wondering whether to go Premium, now's a good time! Check out our new Olympiad Premium Promotion.